How to Force Reset iPhone in 3 Steps - This is a basic iPhone to help the owner to Restart iPhone when got iPhone problem in three steps to Force Reset iPhone so anyone can do this lessons. Whatever your issue on your new iPhone or an old iPhone such as Live Wallpaper problems, iOS problem after update get stuck, iOS 11.3 problems, text message issues, or freezing phone, the fix guide back to fatory settings your device by restart it. 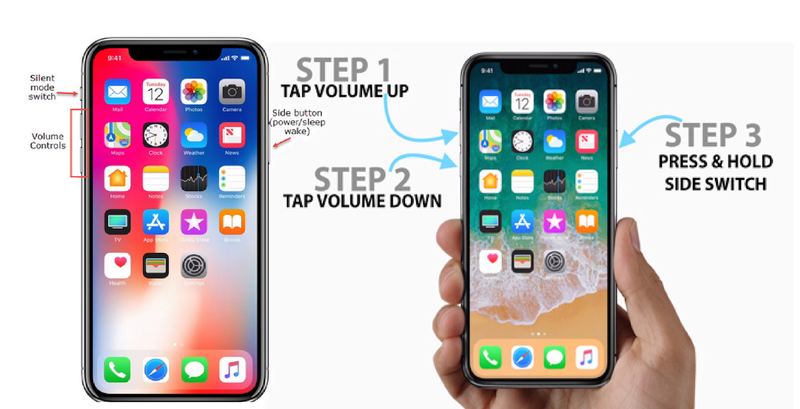 Based on iPhone 8 model or and old version beside iPads, and iPod Touch manually to reset by 10 Press and hold the Top or Side button until the slider appears. 2) The second step, swipe the slider to the other side to turn your device completely off. 3)You must turn it on manually by press and hold the Top or Side button again. If you had and iPhone X model or the latest iPhone models, to force reset or hard reset do by 1) Press and hold the Side button and either volume button until the slider appears. 2) Swipe the slider to the other side to turn your iPhone X, 3) Turn on your iPhone X by press and hold the Side button. If you had a deice sing iOS 11, there are a software to turn off any iOS 11 device, directly go to Settings > General> Shut Down.